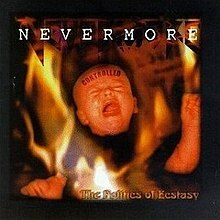 The Politics of Ecstasy is the second full-length studio album by Thrash/Power Metal band Nevermore. It was released in 1996. The album is named after Timothy Leary's book of the same name. The first chapter of that book is entitled "The Seven Tongues of God", which is the title of the first song on the album. There is a spoken word sample in the track "Next In Line" from the Adrian Lyne movie, Jacob's Ladder. All lyrics written by Warrel Dane; all music composed by Jeff Loomis. There is a hidden track (1:19) after "The Learning" ("Love Bites" in the 2006 reissue), after 5 minutes of silence. ^ Kühnemund, Götz. "Rock Hard". 114. Retrieved 20 May 2013. This 1990s thrash metal album-related article is a stub. You can help Wikipedia by expanding it. This page was last edited on 22 March 2019, at 17:46 (UTC).